Two sensational stories in one! The incredible adventures of Charlie Bucket, first in Mr Wonka's Chocolate Factory, and later in the Great Glass Elevator, are famous throughout the world. ... You can join Charlie and witness the miraculous creation of the most scrumptious eatables in the world, and then go into orbit in the Great Glass Elevator! You will soon discover that Mr Willy Wonka is about the most astonishing, fabulous and wonderful character you could ever have imagined! Where you’ll find the youngest students in this school. 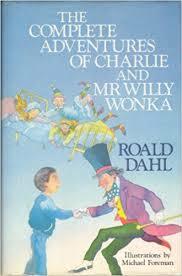 Great story – good to have the both books in one – Roald Dahl books are always good! How many ingredients are in a wonka-vite? How many days do you have to boil the recipe for?